The Omega Directive, is a classified Starfleet Directive that overrides all other Federation Law. Due to its destructive nature upon subspace & its inherent dangers towards all starfaring civilizations, the omega particle has been determined to be the greatest natural threat to the United Federation of Planets and the entire galaxy. For that reason, any and all Omega particles found to be in existence are to be destroyed at any cost. During the duration of said mission, the Prime Directive is suspended. Notification of the crew of a vessel or installation as to the true nature of this directive is an offense punishable by general court-martial, dishonorable discharge from Starfleet, and a prison term no less than 30 years and no greater than the offender’s natural life. The main computer will disengage propulsion immediately and restrict access to shipboard systems. All workstations will display the Greek letter Omega until the disables the encryption. The Commanding Officer of the vessel will secure his/herself in a private location and authorize the release of sensor information from the main computer. 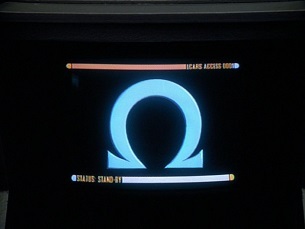 The computer will initialize the Omega Directive, rescinding all other General Orders and Regulations for the duration of the mission. The Commanding Officer will contact Starfleet Headquarters to brief the Commanding Officer of Starfleet of the Omega encounter via an encrypted channel. Starfleet Headquarters will dispatch a specialized away team to resolve the situation. The vessel detecting Omega will be released to return to its original mission. The Commanding Officer is not permitted to discuss with anyone the Omega Directive. The most powerful substance ever to exist in the universe, Omega particles are highly unstable molecules that are believed to have been the primal source of energy for the Big Bang. Due to the incredible amount of energy that is produced by a single Omega molecule, a simple chain of molecules would produce enough energy to power an entire civilization. While Omega only existed in nature for a brief period of time, the molecule can be artificially created with boronite ore. Nonetheless, containment of the molecule is a significant concern as destabilization of the molecule can lead to catastrophe as the explosion of a single Omega particle could destroy all subspace within several light years. Based upon available data the destruction of as few as 200 million molecules would be capable to destroying an entire quadrant of a galaxy. The earliest historical accounts of investigation into the Omega particle was conducted by the Borg Collective. As explained by Seven of Nine, a repatriated Borg drone, the Collective began research into Omega through the assimilation of 13 species to learn more about the particle and its nature. Under the direct orders of the Borg Queen, the Collective made successful assimilation of Omega a priority in their operations as it was viewed as perfection by the Collective. 29 vessels were lost in the experiments - resulting in the death of over 600,000 drones - and only a single molecule of Omega, that remained stable for one-trillionth of a nanosecond, was successfully created. This also led to the war between the Borg and the Undine as it was discovered that the Undine have harnessed the Omega particle as a weapon. In 2268 a group of 127 of the Federation's leading scientists were gathered at a Starfleet Outpost in the Lantaru Sector under the direction of Professor Bendes Kettaract, a Human theorist who had been working on developing a new form of energy generation, under the cover story of developing a replacement for the Spore Drive known as a Coaxial Drive. In reality, Professor Kettaract had been contracted by Section 31 to work on a new source of energy for the Federation that would secure the Federation as the galaxy's dominant superpower. While nearing a breakthrough in their research, Dr. Kerraract and his team were able to synthesize two Omega molecules; however, the amount of energy produced was more than the small outpost was capable of accommodating. The particles began to destabilize which caused the destruction of the Outpost, killing all 127 scientists, and a devastating rupture of subspace within a radius of several light years. This reaction caused warp travel to become a permanent impossibility within the Lantaru Sector and cut two Federation colonies off from the rest of the galaxy. At the insistence of Captain James T. Kirk, who responded to the crisis aboard the Starship Enterprise, Starfleet Command authorized the creation of the Omega Directive. Starfleet had no further encounters with Omega until 2374 when the Starship Voyager encountered the molecule in the Delta Quadrant. Cut off from Starfleet support, Captain Kathryn Janeway and the Voyager crew were required to enact the Omega Directive to eliminate the threat caused by the molecule. The molecules were traced to a Class-M moon inhabited by a prewarp civilization that had been experimenting with the particle as a power source as their race was nearly depleted of all natural resources. It was soon discovered that the race had been able to synthesize over 200 million molecules - enough to devastate the entire Delta Quadrant should they destabilize. Utilizing technology developed by the Borg Collective, Voyager was able to neutralize the molecules before they were able to destabilize. In 2376 members of the Ferengi Alliance were able to acquire a stabilized Omega molecule and were planning to sell the molecule to the Cardassian Union; however, they did not understand the power that was inherent in the Omega molecule. The Tal'Shiar intercepted the Cardassian convoy and were able to acquire the molecule, taking it to a Romulan Starbase for study. This drew the attention of the Borg Collective and a confrontation resulted in which the Borg assimilated the Romulan Starbase and its support ships. Captain Jean-Luc Picard led a Starfleet force to neutralize the Borg and Omega threat from the Enterprise; however, they were too late. The Borg transported the Omega molecule to Unimatrix 01 for further study and created a clone of Locutus to lead a new invasion of the Alpha Quadrant. A combined Federation, Klingon, and Romulan force was able to travel to Unimatrix 01 where they were able to neutralize the Omega particle and return to friendly space before the destruction of subspace. The Titan encountered the Caeliar in the year 2381 and learned that their vessels were powered by Omega. A short time after the Borg launched an invasion of the Beta Quadrant in an effort not to assimilate but to eradicate the Federation once and for all. Through investigations conducted by the crew of the Aventine, Enterprise, and Titan it was discovered that the Borg were descendants of the Caeliar themselves and their quest to acquire Omega had been a repressed memory buried within the collective consciousness of the Borg by the exiled Caeliar and the first Queen. The remaining Caeliar were able to absorb the surviving Borg, ending the threat posed by the Collective. It was discovered by the crew of the Voyager during their return to the Delta Quadrant that Omega is a natural occurrence and that it remains active in a form of subspace; the versions of which have been previously encountered by the Caeliar and Borg are in reality synthetic and imperfect versions. Further, Omega is gradually building in strength and will lead to the eventual destruction of the entire universe. A science team accidentally infiltrated the Omega subdimension and triggered the beginning of the destruction of the universe and the creation of the Q Continuum. Through the work of the Voyager crew, Q, and Q's son the rupture was sealed at the cost of Q's son and Starfleet Officer Afsarah Eden.